1) Create a schematic that has at least one port connected to one component. 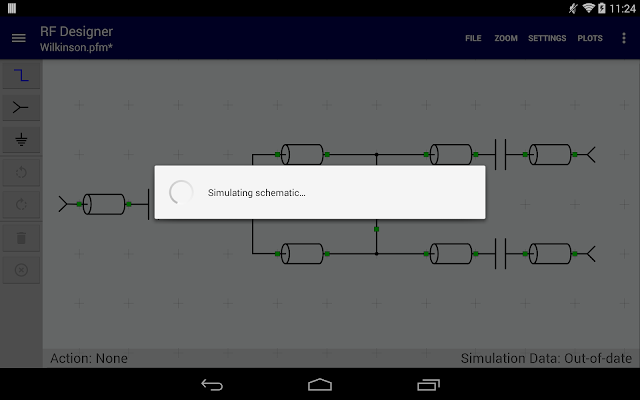 2) Setup the frequency range of the simulation by selecting Settings->Frequency Settings in the action bar menu. 3) Select Simulate from the action bar menu (typically this will be found under the overflow menu item which is shown as three vertical dots in the upper right corner). That's it, now view your results by selecting Plots from the action bar. Please note that information about the current state of the simulated data can be seen in the status bar at the lower right portion of the screen. This will let you know if the simulation data is out of date or not. Last bumped by rftools on Tue Mar 10, 2015 1:40 pm.